Released on: August 23rd, 2017. 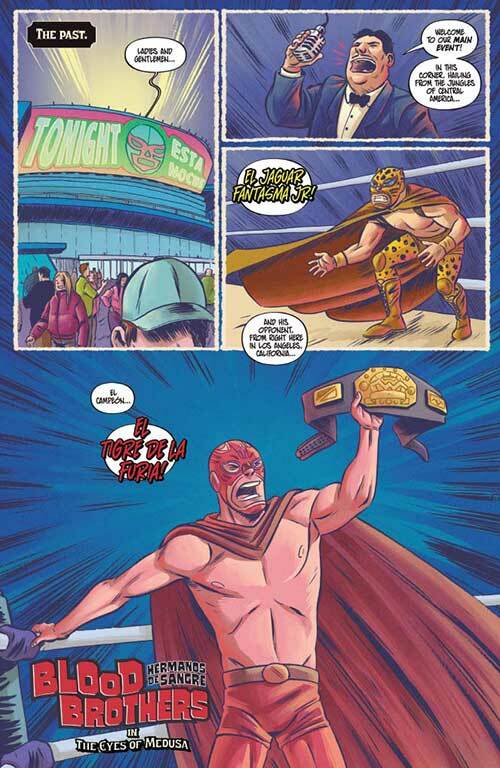 This third issue opens up with a flashback – it takes place ‘in the past’ and in it we see a luchadore from the jungles of Central America named El Jaguar Fantasma Jr. square off against the champion, a Los Angeles native named El Tigre De La Furia! As the match begins, a portal opens up, a horde of monsters appear and El Tigre helps those in the crowd who need his assistance against the attackers. 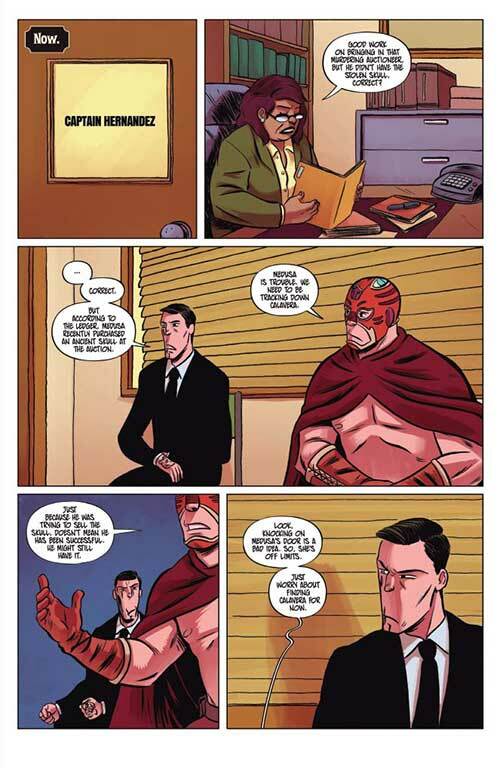 In the present day, Gabriel and Diego are sitting in the office of Captain Hernandez who asks them about their current case – finding the Aztec Skull. They want to go find Medusa, who was rumored to be trying to buy the skull, but Hernandez insists that’s a bad idea and that they concentrate on finding the would-be seller, Calavera. They boys go home to get some rest. The squabble a bit because Diego and Medusa have a history. Gabriel feigns sleep so that Diego will leave and when he does, we see him head out to the Hollywood hills where he meets some monsters. He gives them the password and they allow him entrance to the cave that houses Medusa’s subterranean castle. From there, he heads straight into her lair and speaks directly to Medusa herself. He asks her about the skull – she did recently buy one that belonged to an enemy but claims to know nothing about the one that was stolen from the museum recently. She calls her guards to take care of him but before they can, Gabriel shows up once again to save his brother’s hide. 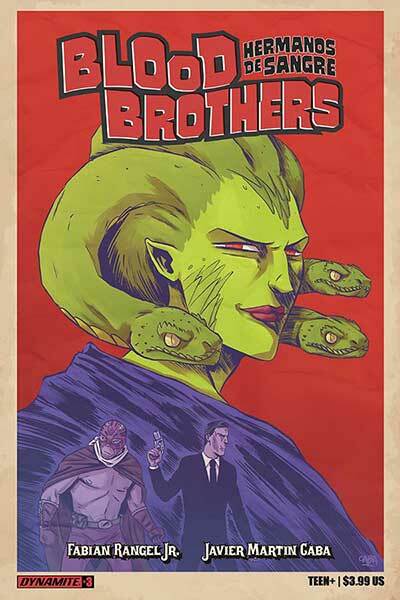 Fabian Rangel Jr. story once again infuses a whole lot of great influences into a really fun read – Mexican wrestling, monsters, hardboiled detectives, Greek mythology and good old fashions pulp fiction are all throw into the Blood Brothers blender and pureed into a beautiful mix of action, adventure and humor. The relationship between Gabriel and Diego, which is simultaneously camaraderie and rivalry, is the backbone of the book and each of the two is given enough of a distinct personality to make them interesting. At the same time, there are some fun supporting players here too – Hernandez is the stereotypical tough police captain (though cast against type, this Hernandez is a female police captain, a nice change of pace! ), Medusa is the seductive monstress you’d expect her to be, and then of course there is that one specific citizen of the labyrinth that the brothers then have to deal with. It’s fun stuff. 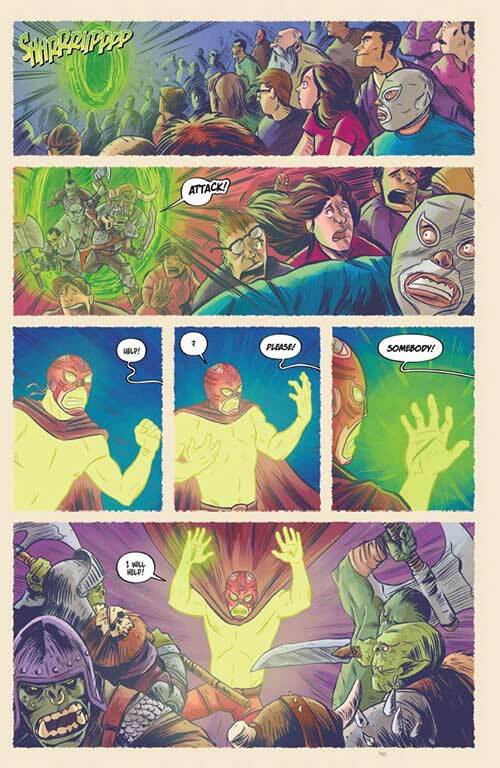 Javier Caba’s artwork suits the story nicely. It’s got flair but it isn’t too flashy. It’s got nice detail but it’s also cartoony in the way that the script is also cartoony (not a bad thing). The coloring work is also really nice, giving the book a bit of a retro vibe to it in that regard. This is a lot of fun. It’s unique, original and fresh but at the same time should easily appeal to those with an affinity for any of the genres/influences that it pulls from. Let’s see what the fourth (and final) issue brings next month!